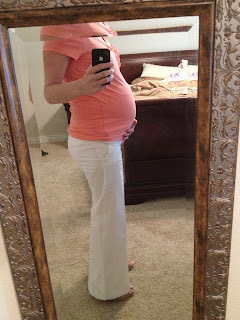 Pixel Perfect: Pregnancy Update...prayers needed! I had the same issue with my last two pregnancies. (the technical term is gestational thrombocytopenia) Both deliveries resulted in postpartum hemorrhaging. Little man's delivery being the most severe. My latest labs are concerning because my platelet count has never been this low this far out from delivery. And they usually continue to decrease the closer I get to my due date. My platelet count before this set of labs said my count was at 137. Not only is 94 the lowest it's been this far out but that is also the steepest fall, usually they fall gradually. Throughout this entire pregnancy I have not felt peace about staying with my current OBGYN especially after visiting an amazing birth center early on in this pregnancy. I was planning on meeting with the midwife again this week or next to discuss making the switch. After the latest set of labs I don't know if I will be a candidate for a birth center birth. "Latest bump picture. 30 weeks! I've been staying up to date with these and other life happenings on instgram. Find me at pixelperfectblog"
But before I received this last set of labs and drew the blood for it I was already doing research on ways to raise and maintain platelet count. I have made some even more drastic changes to my diet, although I wasn't good with it this weekend. There's another homeopathic thing I'm trying that several cancer patients have had great success with. I'm hoping all of this is reflected on the blood work I will be getting on wednesday. Friends you were all so gracious to pray for me during the delivery and birth of my other two boys. My last son's delivery being the best experience. Will you be praying for this one? Specifically that my platelet count will rise above 100 and not go below 100 the remainder of this pregnancy. That I will have a vaginal birth. (a c-section poses a much greater risk of massive blood loss that could result in a hysterectomy or worse.) I want to find a doctor that will be on the same page with me in a vaginal birth because it is the least riskiest way to birth a baby with this condition. Pray that I will find peace in all of this. Knowing my numbers are already this low is causing a lot of fear and a lot of tears. Let's be honest I am a wreck! Baby looked great this morning. He is head down but posterior. Pray he turns to become anterior for labor. Thank you in advance and I will be posting updates as I receive them. Thank you for the prayers Laura! Thank you Brianne for the prayers. It really means a lot! I had hoped to bring the before and after blog hop back this year but morning sickness hit.. :) Hopefully next year. Monica, I just wanted to let you know about my recent birth experience in hopes that it gives you hope. I wanted more than anything for a home birth. My husband was on the fence so we compromised with a birthing center. I was devastated when gestational diabetes and a 10cm ovarian cyst put me into the complicated category and I could no longer birth there. Upon checking in at the hospital the nurses were rude and just laughed when I said I wanted to walk around and not lay in the bed all the time. Thankfully they all changed shifts and I got one of the nurses that worked closely with the midwives. They knew I had wanted a natural birth. The nurse even took the eye gel stuff out of the room so no one could give it too him. She stayed in the room - almost like having a doula. I powered through labor naturally and when I hit my "give me the drugs" point she prompted Marty to remind me of my wants and that I was doing wonderful. In the end even though I didn't end up with my dream 'final' birth experience it was overall positive and I ended up with a great story. I still have the cyst but my natural birth was beautiful and all I could ask for. Thank you for sharing your experience. It does give me hope! Thank the Lord he brought you that nurse! I will be praying your platelets stay in the correct range so there's no bleeding or any other trauma from this pregnancy. Rely on the Lord, do not fear. His mercies are new every morning. Great is His faithfulness unto you, my dear. Lamentations 3:22-25 Consider yourself hugged! Ill be praying, Monica! That God would be with you and your hubby and give you peace and that He would protect the little one inside you and have your numbers go higher! I will keep you and little one in my prayers. One day at a time, in His strength.